And this meme is what I decided to do my annual Lenten project on. Thanks Jim! See? God even works through atheists! What this meme tells me is that millions of people, have no clue of how God works. God rarely, though sometimes does (to specific people at specific times), scream out his existence. Rather, He whispers to us, and those who are listening will hear Him. He hides in plain sight. If we look for Him, He’s easy to find. Basically, God does, and always has, work through people. We are his hands, feet and heart on Earth. We are the evidence that He exists and loves. Painters work with brush, paint and canvas. Sculptors work with hammer, chisel and stone. People are the medium in which God works. Could He just directly fix things if He wanted to? Of course. But in doing so, He would be taking away one of His greatest gifts to us – the gift of Free Will. He doesn’t force any decision on us, but allows us to act or not act as we see fit. He doesn’t force us to love Him. He doesn’t force us to hate evil. He doesn’t force us to acknowlege, or even believe in, His very existence. If He did, it wouldn’t mean anything other than that He has an incredible ego and He needs us to make himself feel good about himself. We would be his puppets and He the puppet master, pulling our strings. Any devotion we would give Him would originate as a demand from Him leaving us no choice but to express our loyalty to Him. That devotion would be empty, devoid of any real love, desire or emotion. It would be superficial – completely worthless. How many of us would be content with a relationship under those conditions? But that’s not who God is. He did give us free will and we are free to follow him or not; free to reflect His love toward others or not – it’s our decision, not His. He only gives us the tools to work with, He doesn’t force us to use them. He loves us enough to allow us to decide for ourselves. Along with free will, God has given many of us great material resources while to some, he has given great material needs. In the great needs of others, God has given those with resources (large or small) great opportunities to be His hands, feet and heart. The opportunity to act in, and convey, His love. He gives us His law, written on our hearts, and, He gives us the choice to embrace His love or reject it. Every human being has been given these gifts (we all start out with an innate sense of right and wrong), though some (many) have allowed that sense to be distorted and twisted in favor of convenience toward one’s lifestyle. It’s up to us to decide whether or not to love. It’s up to us to act on what God has written on our hearts, what we know is right. In the end it’s our decision whether or not to embrace the opportunities that God has given us – not His. If there is hunger, poverty, oppression and great misery in the world – and there is a lot of each – It’s not because God has stood by and let it be so. It’s because we have stood by and let it be so. God has given us the tools and resources to do great good in the world. We have the hammer, the chisel, the stone, the brush, the canvas, the paint. He has also given us the freedom to decide how we will use these gifts, or not use them at all. It’s our responsibility. It’s up to us to create a masterpiece. The meme shows an empty canvas, an uncut stone, not a failure of God to act, but a reason for us to act. 1 If I speak in human and angelic tongues but do not have love, I am a resounding gong or a clashing cymbal. 2 And if I have the gift of prophecy and comprehend all mysteries and all knowledge; if I have all faith so as to move mountains but do not have love, I am nothing. Notice that of the three – Faith, Hope and Love, Love is the greatest and most important. Love is what will create the masterpiece. God’s love made active through people. People with a lot of money. People with little money. People with no money. People with only a smile, a kind word or a caring touch to give. If we don’t create the masterpiece, the failure rests on our shoulders and our shoulders alone. This entry was posted in Catholic interest, My Own Stuff and tagged atheism, God. Bookmark the permalink. So when good things happen because of atheists, this is part of god’s plan? Your god set this all up, made the rules, ensured that humans got kicked out of the garden and so on, yet it is up to humans? Are you sure you want to take that line of reasoning? 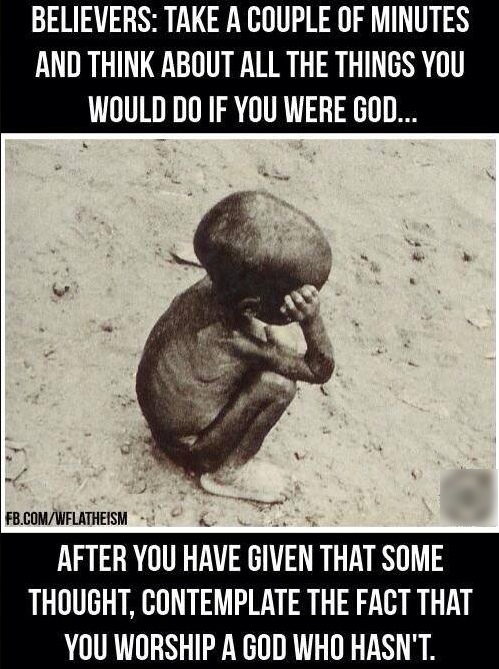 Sure, atheists can do good things as well as anybody. And theists can do bad things as well as anybody. Nobody is perfectly good or perfectly bad. Everybody has free will to choose to do good or bad things. Free will is a gift from God. How we use it is our gift back to Him. Actually, I don’t take that line of reasoning at all. In fact, it appears that that’s your own line of reasoning. It wasn’t God who made sure “humans got kicked out of the garden and so on”. It was humans who made the decision to do whatever they did to lose His favor and separate themselves from Him. And we are still making bad decisions. Happily, we are also making good decisions. Hold up there… Adam and Eve were fine with the rules but apparently god was not. That omnipotent, omnipresent, omniscient being let the snake into the garden to ensure that they ate from the tree. That is if the snake was not the god in disquise. Your god’s love for them was so impressive that he banned them, cursed them, and then created a hell to torture them in. It was not humans that set it all up and then messed it up. The setup was the god’s doing. Humans were just the patsies. You don’t sound like someone who doesn’t believe in God, but more like someone who doesn’t like God and blames him for your misery. That aside, it was still the humans who made the decision to approach the tree and who fell for the serpent’s line after God, for their own good, warned them not to. They failed to heed his warning. And God didn’t didn’t just abandon them to Hell – He promised that He would send someone to reconcile us with Himself, which He did. It’s still up to us to embrace that mercy and reconciliation or reject it. As people, we are responsible for our own decisions, actions or lack of actions. No matter how weak we are.